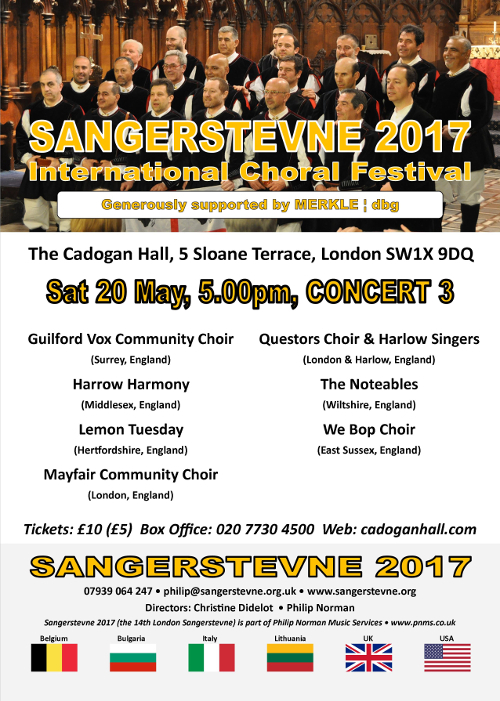 The London Sangerstevne is an annual non competitive festival in which a wide range of vocal groups from across the world will be performing. Harrow Harmony will be performing on the main day Saturday 20th May (the second of the three days) at Cadogan Hall, 5 Sloane Terrace, London, SW1X 9DQ. This is a new venue again for the main festival day, moving from St Sepulchre Without Newgate Church in Holborn. There are four concerts on the day and we will be performing a short programme in the third concert along with other groups from across England, starting at 17:00 and due to finish by 19:00. This will be Harrow Harmony’s sixth consecutive appearance at the festival after making our debut in 2012 so why not come along and support the choir and the festival as a whole.